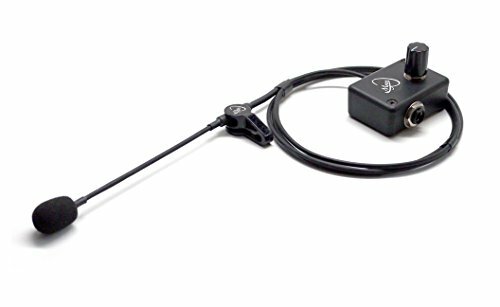 ''THE FEATHER'' OBOE MICROPHONE SYSTEM with FLEXIBLE MICRO-GOOSE NECK by Myers Pickups ~ See it in ACTION! Copy and paste: myerspickups.com by Myers Pickups at Debbie Dee Music. Hurry! Limited time offer. Offer valid only while supplies last. SPECIFICATIONS: Compact Design. Soft Rubber Fluted Volume Knob. Powered Active Preamp. Long Life Battery (included). Mounting Hardware (included). Myers Pickups introduces their NEW lightweight powerhouse. So light that we named it "The Feather." So compact that it can be positioned on a multitude of instruments without modification or permanent installation and still faithfully amplifies the natural tone and beauty of your instrument! Fully equipped with an internally powered, active preamp to produce the richest sound your instrument can deliver! Battery power-source (included) is pre-installed and each pickup is meticulously tested before delivery. No phantom power needed! Compatible with most wireless systems! For more information, videos and additional models please visit: myerspickups.com. Please google us too! If you have any questions about this product by Myers Pickups, contact us by completing and submitting the form below. If you are looking for a specif part number, please include it with your message.